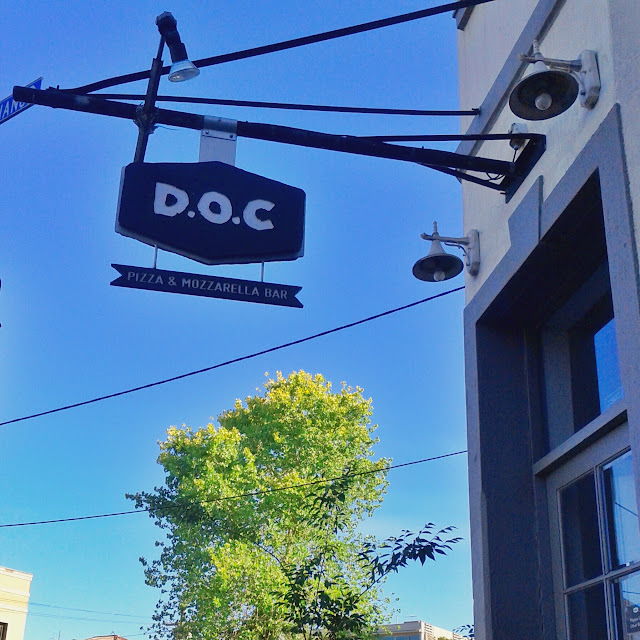 After reading some reviews we decided to check out D.O.C. whilst we were in Carlton. When we arrived at 6:30 on a warm summer Sunday evening most of the other tables were already taken both inside and outside where we chose to sit. Living up to their claim of providing "...real Italian eating and age old simplicity..." the vibe is certainly pretty latin, with most if all the waiters hailing from there. The Carlton restaurant occupies a building that may once have been a pub on the corner of Faraday and Drummond streets, there is also a cafe and a deli on Lygon street not far away. We ordered some drinks and then reviewed the menu featuring a mix of classic and original options. 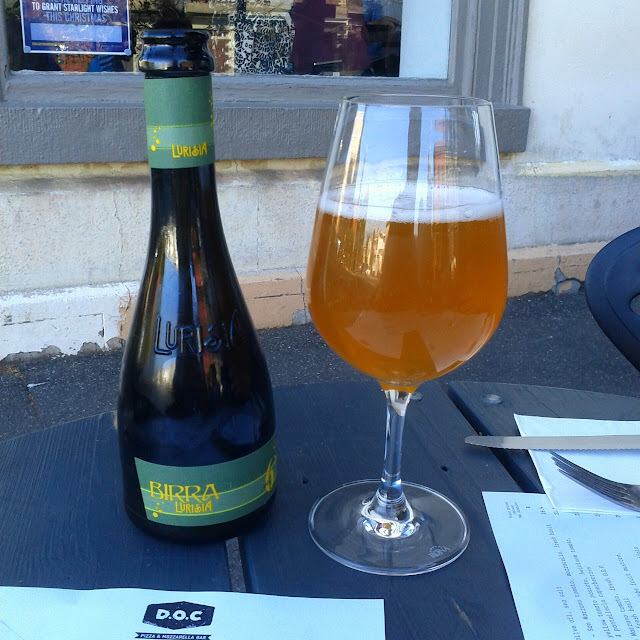 The Lurisia “Sei” or 6 beer I had was a new one to me, a Belgian wheat style beer brewed in Italy which was pretty sweet and a nice change. We grabbed the waiters attention and ordered. 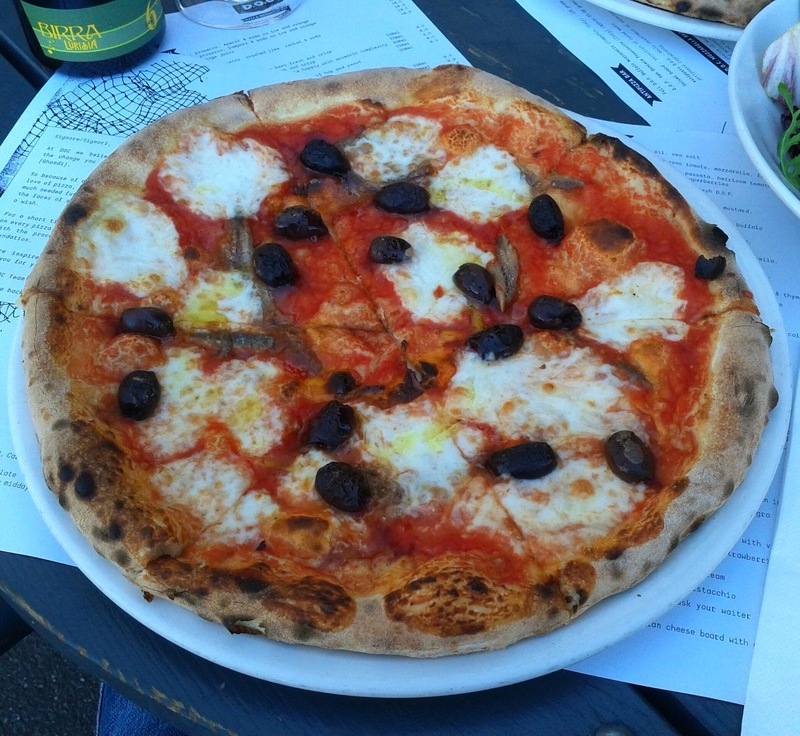 My choice was the trusty napoletana with San Marzano tomato, mozzarella, anchovies and olives. The base was perfectly crisp, light and browned, the flavour from the small salty fish permeated the pizza making a definite hit. 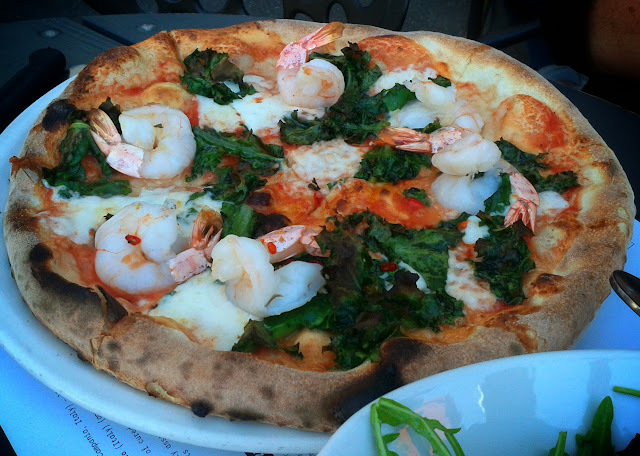 The Pizza Tiger Prawns lived up to its name featuring one crustacean per slice along with tomato, mozzarella, endive and fresh chilli. Again it was cooked just so and the spice permeated the dish. 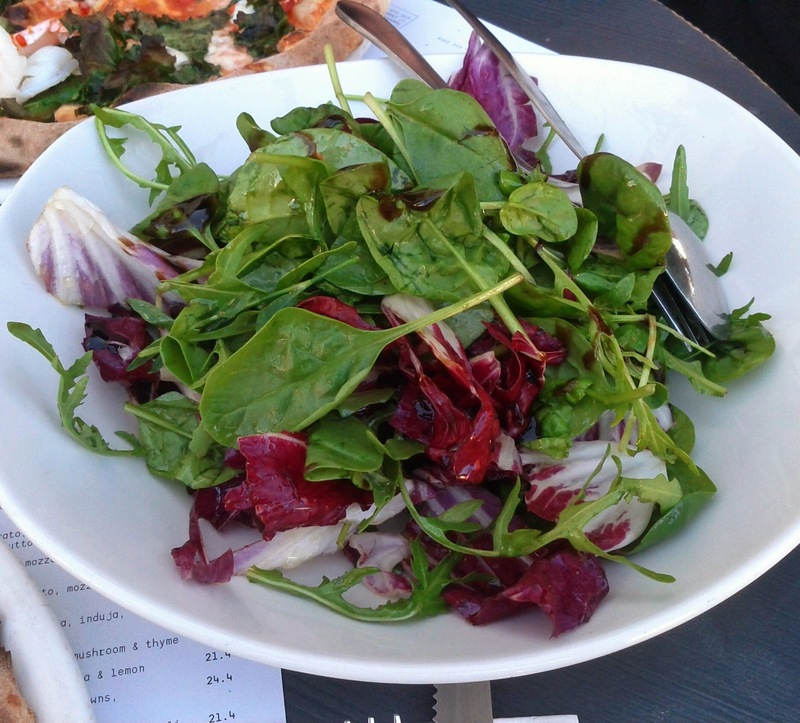 The mista salad of spinach, radicchio and rocket leaves well dressed with olive oil and balsamic vinegar provided a contrast of flavour and texture to the rest of the meal. As we ate the a queue began to form, by 7 it stretched along the front of the building, which made eating our meal feel like being the key attraction in a spectator sport! The pizza's were great, some of the best I've eaten in Melbourne, the service was fairly prompt despite the crowds and certainly Italian and friendly. 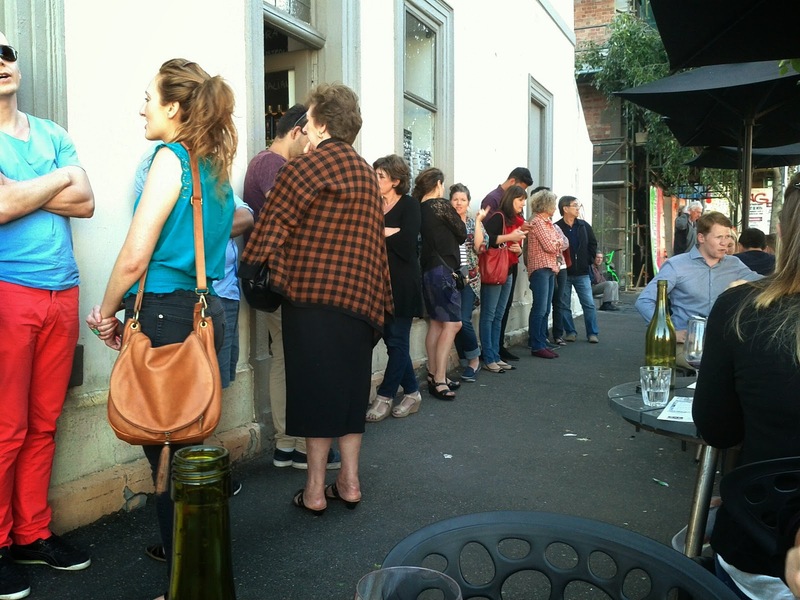 The bill came to $70 with a couple of drinks, and we'd certainly return, being careful to try to get there early if we weren't keen on queueing for a seat.